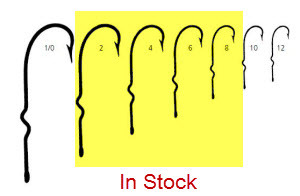 Fly Tying Materials - Hooks - FlyBass.com | Bronzeback Enterprises, L.L.C. At this time, we only carry Mustad 33903 Kink Shank Hooks since so many customers have asked for them. These are perfect for freshwater poppers from panfish (#6 - #8) to larger predator fish (#4 - #2). The smaller the number, the larger the hook. This image is actual size of hooks.